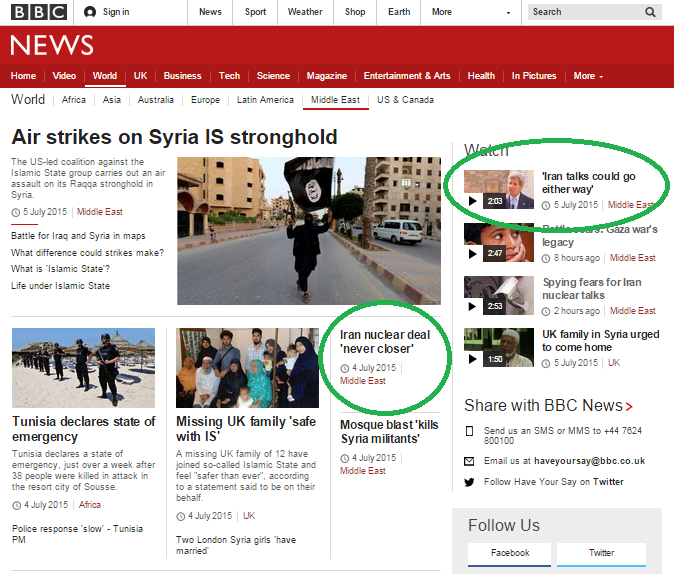 Visitors to the BBC News website’s Middle East page on the morning of July 6th found themselves simultaneously presented with the news that the P5+1 talks with Iran “could go either way” and that a deal on Iran’s nuclear programme was “never closer”. The second of those links leads to an article titled “Iran nuclear talks: ‘Deal never closer’, says FM Zarif” in which, inter alia, readers find the following. “Iran’s foreign minister has used a YouTube posting to say a comprehensive agreement over its nuclear programme has never been closer. Zarif is of course referring to ISIS – as is clear from the full version of his YouTube video, produced with subtitles in several languages. 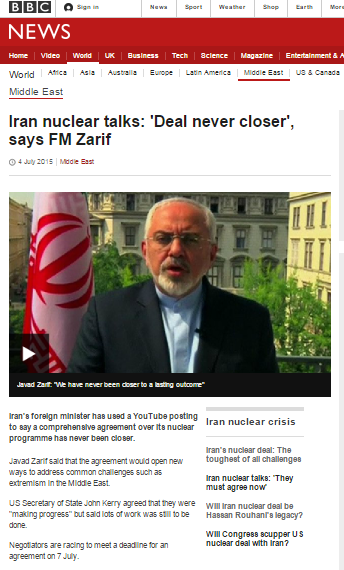 Whilst the BBC has accurately quoted and promoted selected parts of Zarif’s filmed address in this article, what it has not done is to provide audiences with the information about Iran’s own “extremism in the Middle East” – and beyond – which would enable them to place Zarif’s PR messaging in its correct context. Iranian patronage of Hizballah, Hamas and other terrorist organisations goes unmentioned. Iranian intervention in the Syrian civil war is ignored. Iranian terror in locations as far apart as Buenos Aires, New Delhi and most recently Jordan is erased from audience view along with the extremist Iranian regime’s repression of minorities and dissidents within its own population. Whilst the BBC’s unqualified, context-free amplification of Zarif’s messaging is remarkable in its own right, it is also significant from the point of view of what Jonathan Schanzer calls ‘the Daesh Effect’. “A growing gaggle of Western governments now appear to be altering their threat assessments of violent groups in an apparent effort to enlist them in the fight against the Islamic State. Is the BBC afflicted by ‘the Daesh Effect’ too? Certainly articles such as this one add to the impression already created by the corporation’s unusual categorization of the June 26th attacks in Tunisia, Kuwait and France as terror. It would appear that as far as the BBC is concerned, attacks attributed to ISIS actors or sympathisers can be labeled differently to those carried out by other terrorist organisations. But as a publicly funded body charged with the remit of building “global understanding of international issues”, it is the BBC’s job to make clear to its audiences that even when a nicely spoken Iranian minister talks about tackling “extremist violence”, he is still the representative of a theocratic extremist regime which both sponsors and engages in terrorism worldwide.